"To all those bowlers in the District who contributed in any way to my charity during the 2015 season. I wish to say a very big thank you to to you all on behalf of NAOMI HOUSE for helping to raise the magnificent sum of £873.62. I have received a letter from them thanking us in the District for our generosity, enthusiasm and support. I hope we all will give equally of our support to next years President and his chosen charity. ​With 2016 all set to be a very important year in District history I hope that both clubs and individuals will contribute even more of their time and input then in previous years and start off with 100% representation at the forthcoming A.G.M." In two tight semis. Andy Anderson overcame Martin Wise & newcomer Andy Dawson from Lockswood slipped past Simon Chalk. The Final was a classic between two well matched opponents. Nip and tuck all the way each player displayed a good mix of drawing shots, running woods and the occasional flash of violence. With the score at 18-17 Anderson use all his skills to score a brace of twos to end up the winner. Truly a memorable final! In the semis. Garry Squires & Steve Whitehead overcame Adam Curnow & Terry Westerman whilst Miki Comley & Steve Rice had a last bowl win over Steve Saunders & Garry Carter. In the Final Comley & Rice always had the edge and prevailed 23 to 15.
semis. Kevin Hill, Tony Spridgeon & Ian Stubbington overcame Chalke, Cummins & Cummins by one shot whilst Jim Barrett, Richard Curnow & Mick Barrett had a slightly easier passage against A.Smith, A.B. & A.C. Forrest. In the Final a tight game was more or less settled by a 5 on the fifteenth end with Ian Stubbingtons lads triumphing 17-13.
semis. Barrett,Curnow,Love & Barrett cruised past Adam Curnow, Graham Windle, Terry Westerman and the Veteran David Hughdie whilst B. Roberts, D. Murray, D. Fulker & John Wise won a tighter affair against S.Hayes, M. Millington, S. Spredbury & M. Rowell. In the final Wise & Co. were 9 nil down after 7 ends, 12-16 down at 19 ends and then proceeded to win with a 2 and a 4. What a finish! In the Veterans Singles Clive Puttock overcame Joe Ralph in the semi-final and John Wise in the Final after being 10-18 down and by winning 21 to 18 retained his title. The Benevolent Pairs was won by R. Speigal & M. Burnett who overcame G. Hallett & J. Ackhurst in the semi-final and then just beat M. Linn & D. McLellan 20-18 in a well contested final. In the Under 25 Final Lee Allen had a comfortable win over L. Waldron who unfortunately could not reproduce his form of the previous day. In The CHAMPION OF CHAMPIONS semis. Martin Wise won 21-15 against R. Waller. The other semi. produced a cracker! Andy Anderson lead 19-9 and 20-14 but Ian Stubbington refused to lie down and in a thrilling finish won the last 5 ends to win 21-20. In a well fought final Martin won by producing two consecutive twos to win 21-15. All in all a wonderful weekend blessed by good weather and plenty of good bowling. Thanks as always to the Atherley Club for providing a good green and excellent supporting facilities and to the Markers and all those who assisted in any way. David Hughdie, District President. 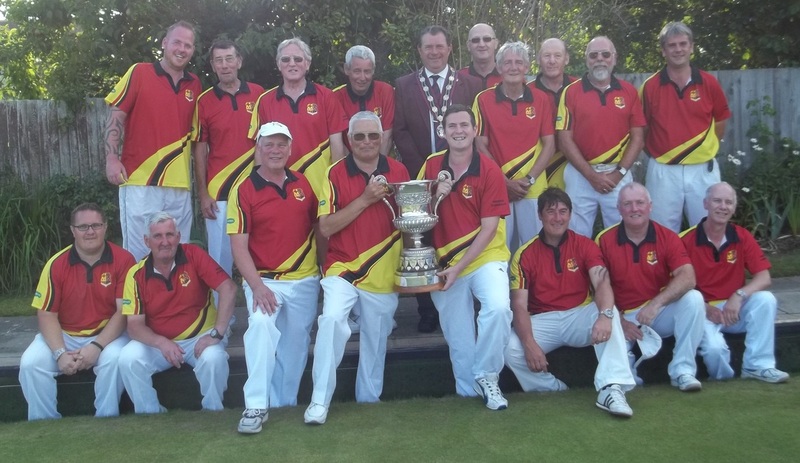 Fleming Park Bowling Club won the Championship Division One in a closely competed division, any of the top three teams, Fleming Park, Eastleigh Railway, and Sports Centre, could have won the league going into the final week. Congratulations to Eastleigh Railway, For the first time in their long history they were crowned Hampshire County Club Champions on Sunday 2nd August at Atherley Bowling Club They defeated Cove by 20 shots in the Semi Final, and then overcame Southsea Waverley by 6 shots in the Final. Bowlers from all over the UK and the Channel Islands gathered together last week for the 63rd Annual Southampton Open Bowls Tournament, based at the Atherley Bowling Club, but with early round matches also taking place at the Banister Park, Pirrie Park, Southampton Old Green and Southampton Sports Centre greens. Following the traditional Opening Ceremony at Atherley BC on Monday morning the action got underway with the opening round of the Men’s Pairs. Despite the weather forecast for the first part of the week being mixed the matches were keenly contested, but in keeping with our reputation as the “friendly” Tournament, in a sporting and fun atmosphere. Spectators were treated to some exciting games with tight finishes and extra ends as the week progressed, and they certainly contributed their fair share of amusing comments to add to the lively on-green banter! In the second half of the week we were blessed with lovely hot sunshine from Thursday onwards and the Atherley was packed on Saturday for the Finals of all the Competitions. As has been the trend in recent year’s bowlers from all parts of the UK and the Channel Islands made it through to battle it out for the trophies, supported by an enthusiastic and knowledgeable crowd. The “Blue Riband” Men’s and Ladies Singles Finals saw victories for Neil Smith, from Wootton Bassett, who narrowly defeated Dave Richardson, from Popes Mead, 21-20 in the match of the day, and a 21-4 margin for Lorraine Slater from Banister Park who proved too strong for her opponent Diane Canavan, from St Saviours BC in Jersey. Dave Murray & Gary Carter from our host club, Atherley ran out handsome 25-15 Men’s Pairs winners against local bowler Jamie Lawson & his partner Greg Davis from the Sun Bowls Club in Jersey. However Jersey BC bowlers Tracey O’Connor and Yvonne Andrews bagged the Ladies Pairs in a tightly contested match with Katy Smith from Wootton Bassett & Christine Hewison from Bromley BC 18-15. In the Triple’s Neil Smith from Wootton Bassett teamed up with Scotty Ruderham and Malcolm De Sousa from the Sun Bowls Club in Jersey, and in an exciting tussle ran out 18-16 winners against the Banister Park trio of Gary Squires, Bob Squires and John Halliday. The Ladies final was a little more one sided with the Atherley/Jersey BC combination of Tracey O’Connor, Jackie Farmer and Yvonne Andrews defeating the all Atherley trio of Anne Pearce, Jean Terrell and Joan Penfold 21-9. Connor Rabey from Vale Recreation BC in Guernsey made history with his third Open Singles Plate victory in a 21-8 win against Didier Le Falher from Jersey BC and in the Open Consolation Pairs Chris Andrews from Jersey BC and Jim Farmer from Atherley triumphed 21-9 over Richard “dickie” Allen & Brian Bisson from St Saviours BC in Jersey. 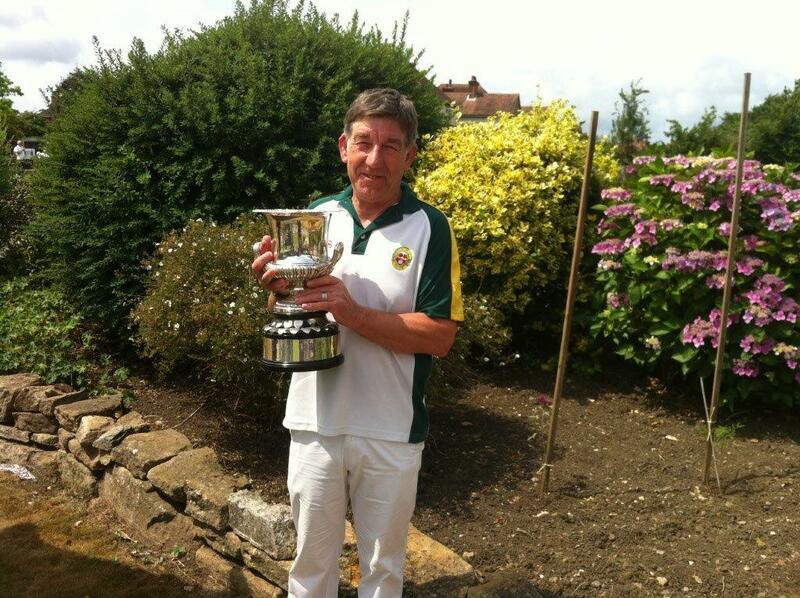 Southampton Old Green Bowler Hampshire Champion. were no better in the Triples with both Sports Centre’s Peter Ward( 12-13) and Fleming’s Alan Forrest (12-18) losing at quarter final stage. In the Pairs quarter final Banister Park’s Barry Bendall and Stuart Buchanan lost to the 2014 champions and eventual 2015 winners Alex Marchant and Mark Griffiths and although Sports Centre’s Keith Charbitt- Middleton and Phil Hunt progressed to the semi final they too went out (11-22)to the other Southsea Waverley pair. Dow, Forrest, Ward, Clarke and Allen will now represent Hampshire in August at the National Championships in Royal Leamington Spa. Planetbowls Singles tournament event details received, click on the 'whats on' page below for further information. If your club has an event let us know using the form on the 'whats on' page. Match Report Page added, enter your own reports online. Also contains the Results & Tables each week for you to download and print out. Link to League Republic on League News Page, for Live Results & Tables. All the Fixtures for 2015, are now available to view on the League Republic Website. 'Enter your results online' feature coming in 2016.